GlobWetland Africa is a large Earth Observation application project funded by the European Space Agency (ESA) in partnership with the African Team of the Ramsar Convention on Wetlands. The project is initiated to facilitate the exploitation of satellite observations for the conservation, wise-use and effective management of wetlands in Africa and to provide African stakeholders with the necessary Earth Observation (EO) methods and tools to better fulfil their commitments and obligations towards the Ramsar Convention on Wetlands. As a principal objective GlobWetland Africa (GW-A) will be developing and demonstrating an open source and free-of-charge software toolbox for the end-to-end processing of a large portfolio of EO products and the subsequent derivation of spatial and temporal indicators on wetland status and trends, from local to basin scales. 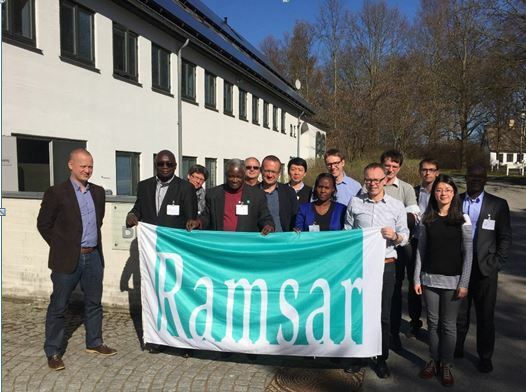 GlobWetland Africa milestone meeting took place on 11 – 12 April at DHI GRAS Headquarters in Hørsholm, Denmark. System Requirements Review (SRR) hosted the meeting with members of User Advisory group (one of the GlobWetland Africa bodies), Ramsar representatives, the European Space Agency (ESA) to discuss further developments of the project. Selection of “test sites” (for method development and testing) and definition of a preliminary list of possible “pilot sites” for subsequent larger scale demonstrations. The SRR represents the first milestone for GlobWetland Africa and successfully concludes the engineering requirements of the project. The next phase will focus on the toolbox engineering i.e. documenting and prototyping the software architecture as well as all the design engineering results related to the implementation of the end-to-end processing chains for all the wetland information products to be provided i.e. wetland inventory, habitat mapping, water cycle regime, water quality, river basin hydrology and mangrove mapping.